The door to Cuba’s soul, Havana captivates with its larger-than-life culture, sultry rhythms and weathered beauty. Take a relaxing stroll along the evocative Malecón, the quintessentially Cuban thoroughfare and get lost among the Baroque facades and colonial cobblestone streets of Old Havana. Enjoy traditional Cuban fare such as moros y cristianos (black beans and rice) and ropa vieja (shredded beef).Visit the grandiose Capitolio Nacional and explore the world-class art collection at Museo Nacional de Bellas Artes, which showcases everything from colonial-era paintings to countless masterpieces from Cuba’s famed Vanguard period. Enjoy a friendly game of dominoes with the locals. Sip a daiquiri at Hemingway’s favorite haunt, El Floridita, happen upon a live jazz group and simply savor the eclectic moment in this unique corner of the Americas. 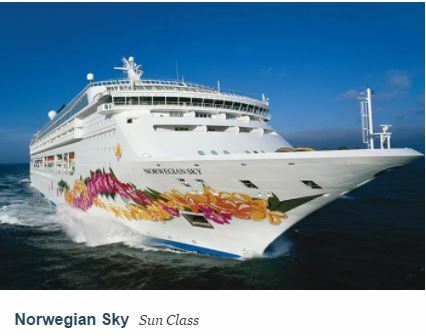 Norwegian Sky is the largest U.S. cruise ship offering cruises to Cuba. Cruise into history with Norwegian - the only cruise line with 4-day round trip vacations from Miami and an overnight stay in Havana, Cuba with an All-Inclusive experience including unlimited drinks. Book now and receive $50 FREE onboard spend on Norwegian Sky, plus reserve your cruise with just $50 deposits per person. Norwegian offers OFAC-compliant cruises and shore excursions.